This Amish handcrafted Waterfall hope chest is proudly made in the USA of 100% solid cherry wood. The rounded top and scalloped foot make for a stylish, classic design. As the years go by, fill it with many treasures, keepsakes to pull out and admire over the years. Customize the look of your hope chest by selecting from our many options. 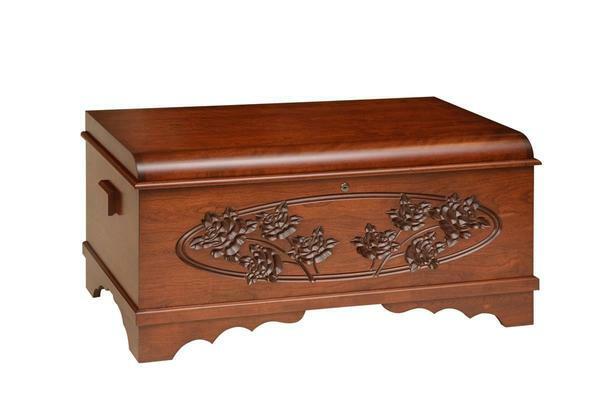 This chest comes standard with a cedar bottom, spring lid support, and lock. Full cedar lining is also available. This beautiful Heirloom Chest is handcrafted using solid cherry wood. My hope chest arrived and I love it. The craftsmanship and finish is more than expected.